Chefs Peter Hoffman and Susan Rosenfeld opened Savoy in 1990 with a simple premise in mind — to create delicious and memorable meals by sourcing the best ingredients from local farmers in the tri-state area. Rated two stars in 1995 by Ruth Reichl, then main restaurant critic for the New York Times, the restaurant lies off the beaten track in terms of New York City’s food scene. The food at Savoy embodies the style of cuisine practiced at other temples of market cooking such as Blue Hill and Chez Panisse. Out of 10? A moderate range 7. Crispy pork belly salad started the meal off on a strong note. 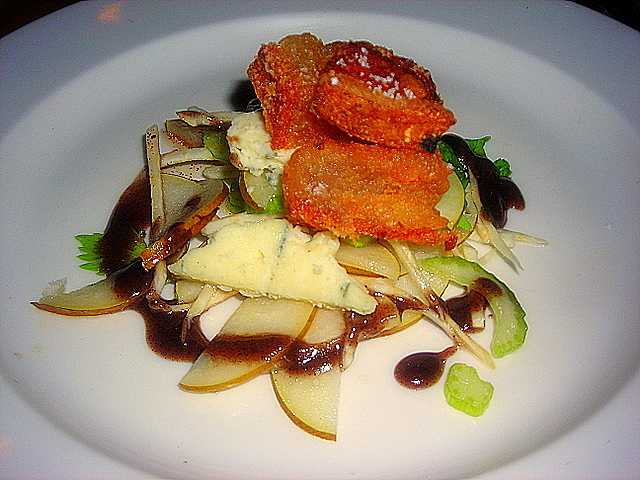 Nuggets of pork belly stood in perfect contrast when paired against a smoky rogue “blue” cheese and slices of Asian pear. 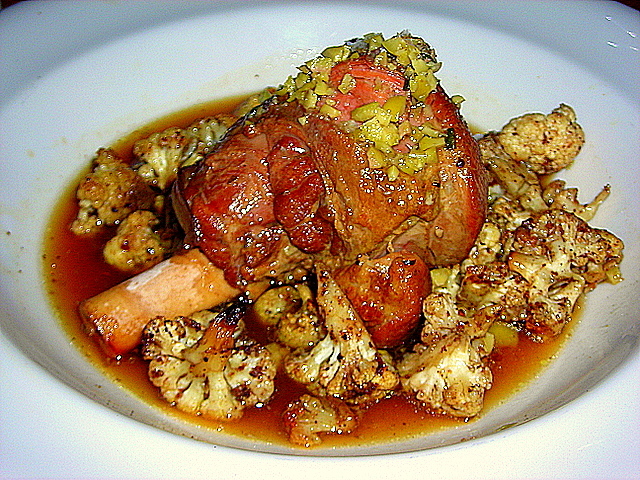 Braised lamb shank was wonderfully tender, almost falling off the bone though the roasted cauliflower that it came with could’ve used a touch of salt. 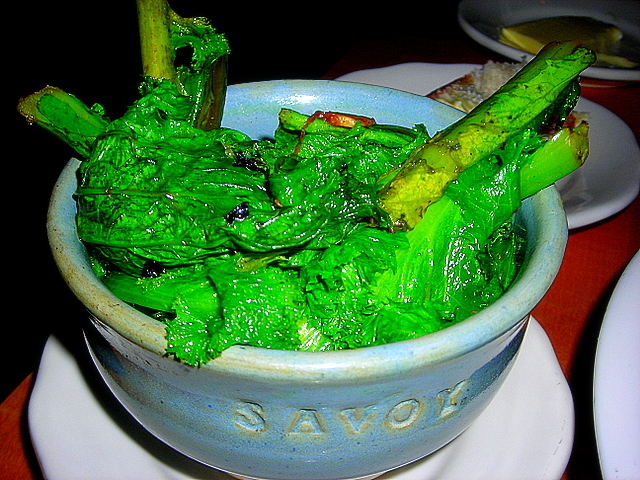 Broccoli rabe was a tad undercooked; if it was sauteed with lemon, I couldn’t taste any hint. 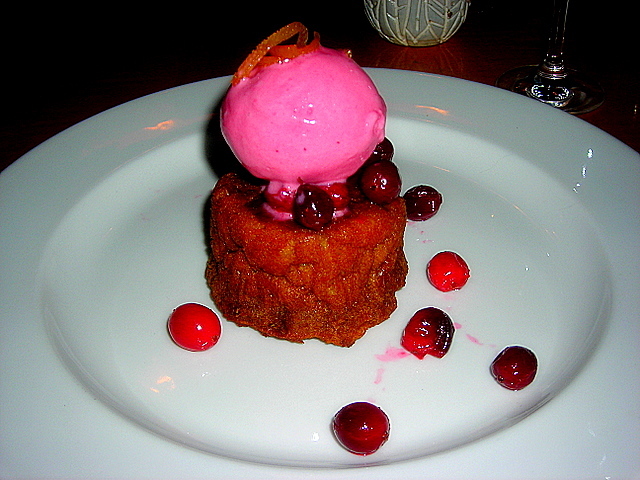 Pumpkin bread pudding had no “wow” factor and the accompanying compote needed something to take the edge off. I want to love Savoy. I’ve heard so much about this restaurant from ardent followers of Chef Hoffman’s food. It’s not that I don’t appreciate his style of cooking. It’s that the food seems perfectly fine — and yet I get the sense that it could be so much more. Savoy is located at 70 Prince Street [Crosby Street] in SoHo. 25 Nov	This entry was published on November 25, 2007 at 12:43 am and is filed under food, general, New York City. Bookmark the permalink. Follow any comments here with the RSS feed for this post.